Carriage houses recall a gentler time, when families used horses and carriages to transport people from place to place. Because of the animal element, carriage houses were by preference situated away from the main house. The advent of the post-war suburban development where most families enjoyed automobile ownership for the first time, garages became incorporated into the home design and attached to the house. Unfortunately, many home designs seem to lead with the garage, which becomes the focal point of the entire home. 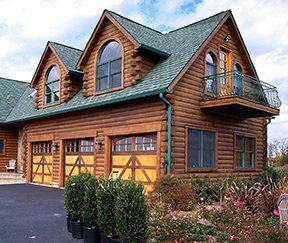 Homeowners with a larger land parcel have the option to place their log home front and center, while positioning the carriage house to maximize the land and the home design. As separate structures from the actual home, the code requirements for energy efficiency will in most cases be much lower than the primary home. A slab foundation on footers, exterior shell with only minimal finishing inside can save on materials and labor. For log homes built in areas with measurable winter snowfall, owners will also benefit from having more room to pile snow away from structures and walkways. Many municipalities tax outbuildings or structures unattached to the primary residences at a lower rate, and so if real estate taxes are a concern, this strategy could provide a significant reduction over a home with an attached garage. The carriage house can provide a good deal of storage area, especially for families with more than two vehicles. Tractors, snowmobiles, sporting equipment and workshops can all find a home in the well-appointed carriage house. Adding an open loft area above the lower level can add lots more storage space with little extra cost. More ambitious homeowners can treat the upper level of a carriage house as a guest suite, nanny or in-law apartment. This too, should be cleared with local code enforcement before improving a storage only carriage house. Even if the loft is not immediately developed, making sure plumbing and wiring is roughed in is a simple extra that makes later expansion and finishing easier. 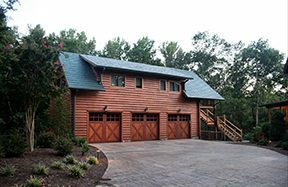 Katahdin can provide designs for carriage houses to complement any of our log home designs. One cost-saving option is to frame out the structure with dimensional lumber then add log siding to complete the look and match the main house.